Very nice watch. It was working for hour and stop. Have to replace battery. Look expensive. 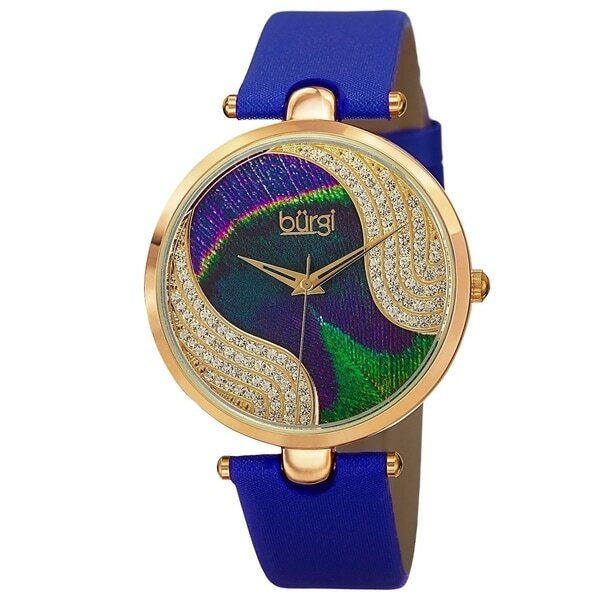 This dazzling Burgi women's watch has a unique peacock feather look creating a definite eye catcher. Crystals and a bright leather strap add a sparkle to your day. This reliable Swiss quartz timepiece could be worn for any occasion. I ordered the watch with the black band. It is just as pretty on line as it is on my wrist. Very rich looking because the Swarovski crystals are plentiful and show beautifully. Happy I ordered the watch. One other thing, I have another Burgi watch and love that one also. I returned this watch because I did not like the colors in person as compared to the photos. I also purchased the cream colored strap and gold color watch face, which I liked much better than the blue - the colors of the peacock and little jewel-like stones on gold color face complemented the cream strap. I kept that one. Amazing watch. Super stylish and comfortable. It actually goes with most of my clothes despite the colorful peacock design. It’s great for every day wear. The face is the perfect size as I have a little wrist. I love it! I bought this as a gift for my sister. The crystals SPARKLE and she receives tons of compliments. The band was thinner than I hoped and the peacock detailing doesn't seem to pop like it does in the picture (and compared to the crystals). When I first saw this watch it was a sale. It's uniquely styled face, with crystals on either side of the Peacock design was breathtaking. The ideal design features take this watch to another level. The graceful, flair of design makes this a memorable piece. I recommend it to family and friends. I'm sure that I will enjoy many years with this timeless piece. I am disappointed with the color on the watch face. It looks like a cheap piece of colored paper that the crystals were set into. The crystals are nice quality but the colors are faded looking. LOVE IT!!! Quality all the way around. My first burgi watch and now I'm shopping for more. Crystals have nice bling not overwhelming simply eye catching. Dress or casual its a winner. Beautiful watch. This make the 4 th watch I have. Love all the colors. Everyone is a little different in color but basically the same design. I would definitely recommend this watch. very nice watch, I love it ! This watch is beautiful and everyone who sees it is wowed. This is a great deal. Item is as advertised.Arrived on time. A great gift idea. But this one's for me! It was ok, looked better in the pic Than in real life! This is a rather sedate peacock watch. It is not flashy but rather conservative. It is good for work--business. The band is rather stiff until broken in. very bland and *** quality watch. Nothing exciting, nothing worth the price. Cheap band and watch face was below standard. I returned this very quickly as there was just no way I'd pay that price for this watch. Too big ,doesn't look good on my hand.Not clearl.I don't like it . You sent the wrong watch and in less than a year the bands were worn out. They are going to be hard to replace. So it sucked!!!!!! "The black watch in the pic online shows ROSE TONE, but in the description, it says they are all GOLD. Is the black one in rose tone? That is what I'd like. Ty vm!" Hello tangobella, unfortunately this item is out of stock. We currently do not have inventory to check, and cannot guarantee the item will be restocked. Thank you for shopping with us. "i want a watch with a blue band which is what is being shown but options only list red and black why ?" Hello mrford, the blue is currently out of stock. Only the in-stock colors will be listed from the options drop down box. We apologize for any inconvenience. Thanks for shopping with us!